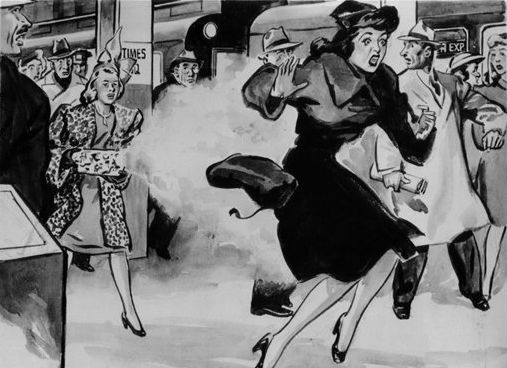 New Year's Eve, 1946 was the occasion of a classic weird crime. 19-year-old Pearl Lusk thought she had been employed to do some detective work by Allen La Rue, whom she had met on the subway. He told her that he was an insurance investigator. Her mission was to track a suspected jewel thief, Olga Trapani, and collect evidence to build a case against her. Lusk trailed Trapani for a few days, and then La Rue added a new twist to the assignment. 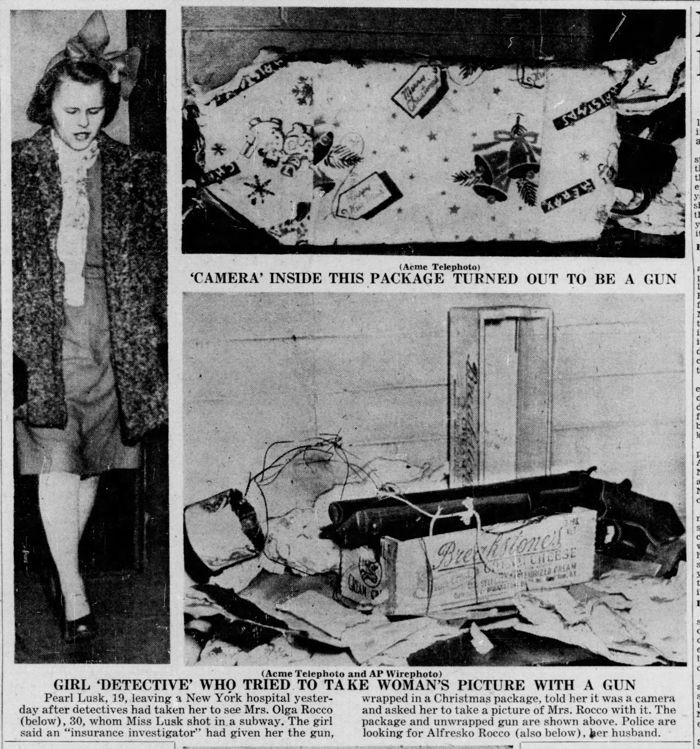 He gave her what he described as an "X-ray camera" camouflaged as a gift-wrapped package and instructed her to take a picture of Trapani with it. The resulting photo, he said, would reveal the jewels that Trapani kept pinned inside her dress, around her waist. Lusk dutifully followed Trapani into the Times Square subway station, pointed the camera at her, and pulled the trigger wire. A shot rang out and Trapani collapsed to the ground. It turned out that the "X-ray camera" was really a camouflaged sawed-off shotgun. And Trapani was really La Rue's ex-wife, of whom he had grown insanely jealous. 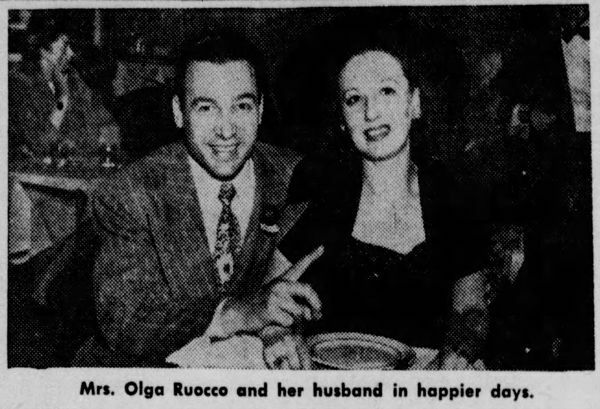 La Rue's real name was Alphonse Rocco. He had been stalking his ex-wife for several months. Lusk was totally clueless about what she had done. As the subway police rushed up after the shooting, she told them, "I just took this woman’s picture and somebody shot her." Rocco fled to upstate New York, where he died in a shootout with the police several days later. Trapani survived, but lost her leg. She and Lusk reportedly became friends after the incident. You can read more about the case at EinsteinsRefrigerator.com, or the New Yorker. 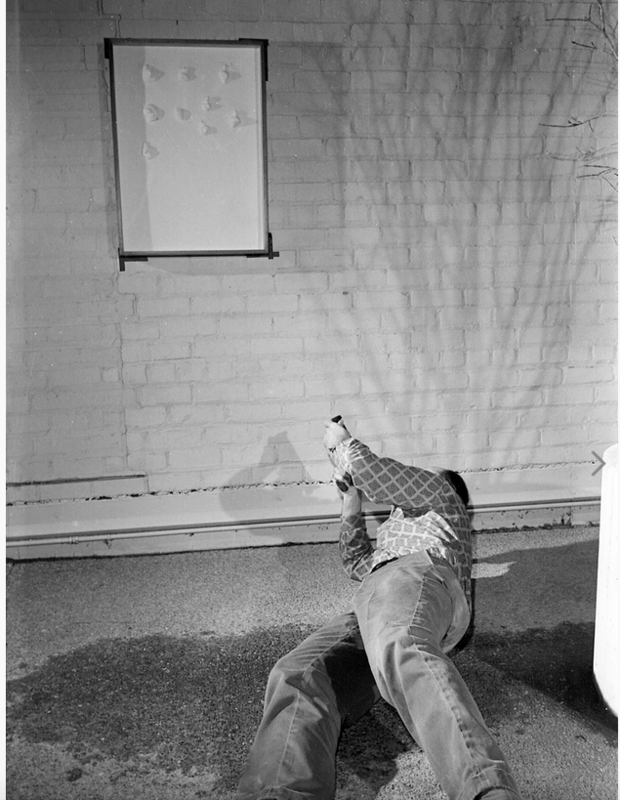 We've discussed much gun-based art here before--artists shooting themselves or other objects--but I do not believe we have yet covered this instance by Niki de Saint Phalle. 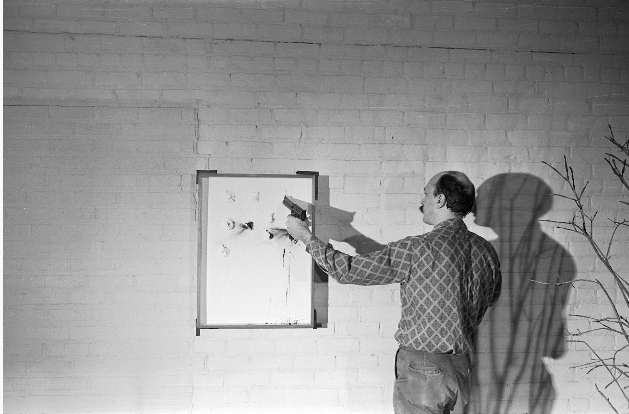 A white canvas with bags of paint concealed beneath was to be fired upon, releasing the paint in random patterns. 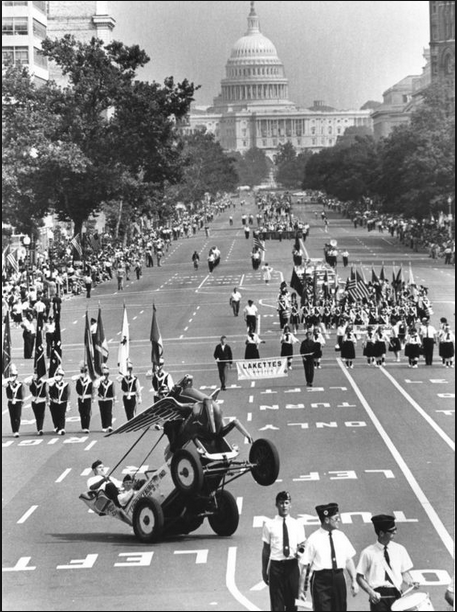 But the project proved more intractable than anticipated. 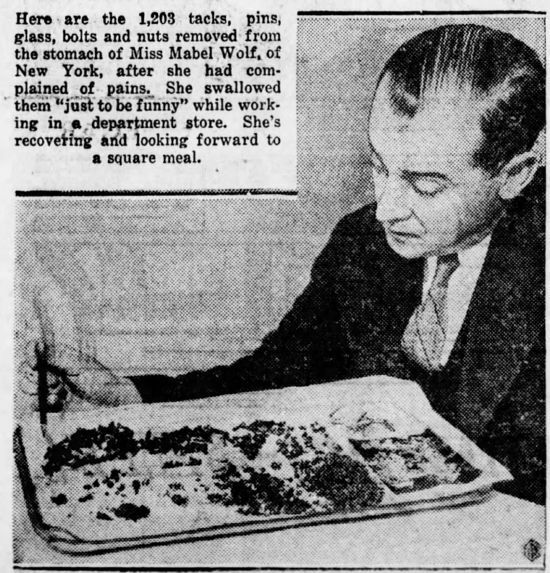 March 1934: Forty-year-old Mabel Wolf of Brooklyn showed up at Kings County Hospital complaining of acute stomach pain and a loss of appetite. An x-ray revealed the presence of a large clump of metallic objects in her stomach. In a subsequent hour-long operation, surgeons removed 1,203 pieces of hardware from her stomach. The objects weighed a total of one pound, three ounces. Amazingly, they hadn't done her any serious harm. 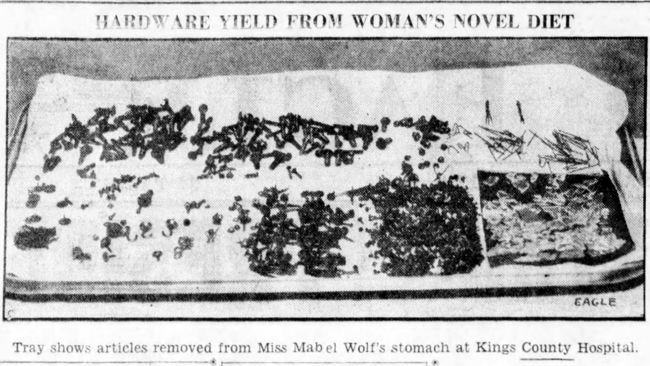 When pressed further, Miss Wolf said, "I really don't know what started me on my diet. I guess I was just trying to be funny. Don't ask me any more about it. I only want to get well and go home." Miss wolf had suffered minor stomach pains for five years as a result of the objects, but she had been able to self-treat the discomfort with patent medicine. She finally went to a doctor when the pain became too intense. One mystery that the doctors weren't fully able to explain was why the metal objects all clumped together in her stomach. Dr. Edwin H. Fiske speculated that "metallic objects in the stomach take on a kind of magnetism, which attracs the individual objects to one another, so that they cling together in one large ball, as if welded together. Thus the danger of the cuts from pointed nails and pins is lessened." Evidently Miss Wolf suffered from the eating disorder known as pica, which is a compulsion to eat non-nutritive items such as paper, metal, chalk, mud, etc. I suspect that her strange diet hadn't been confined to a single week. She'd probably been doing it for quite a while. We've previously posted about a few other people who suffered from this disorder, including the boy who ate the Bible and the Human Ostrich. If you're interested in the subject of pica and people swallowing weird things, you can find a whole bunch of cases discussed (including Mabel Wolf) in Swallow: Foreign Bodies, Their Ingestion, Inspiration, and the Curious Doctor Who Extracted Them by Mary Cappello. 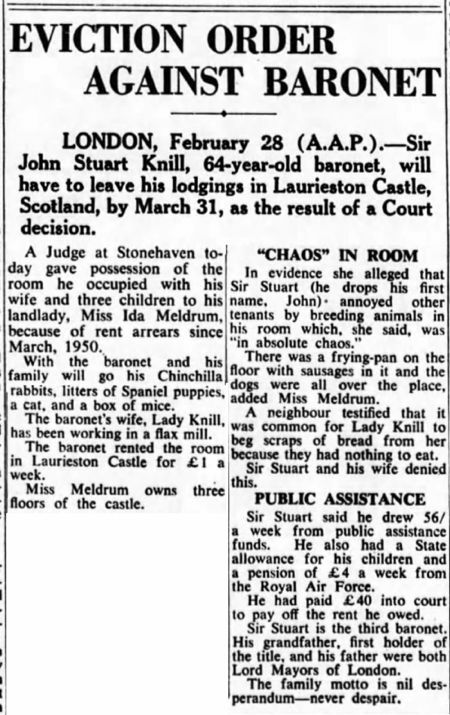 Sir John Stuart Knill (1886- 1973) achieved a minor degree of fame because he was poor — and because he also happened to be a Baronet and so was part of the UK's hereditary aristocracy. As the British media often described him, he was "England's only Baronet in public housing." As Sir Knill struggled to scrape by, moving from one low-paying job to another (street sweeper, postman, cat breeder), the media gleefully reported each time his circumstances sank slightly lower. 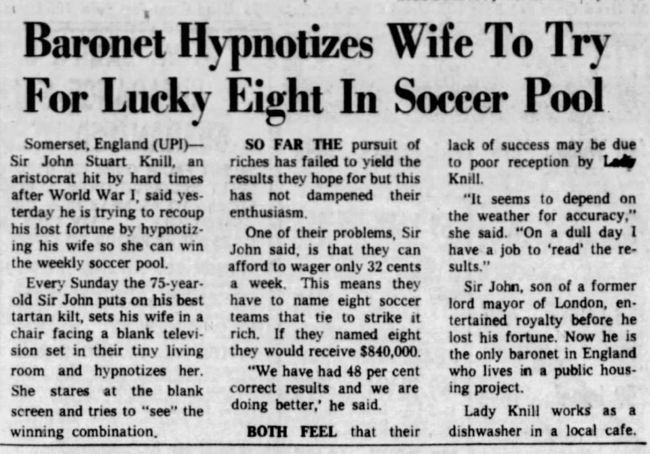 Knill was born into wealth. It was his grandfather, Stuart Knill, who was made the first Knill Baronet in 1893 (official title: Baronet Knill, of The Grove, Blackheath and Fresh Wharf, London). The 1st and 2nd Knill Baronets both served for a time as Lord Mayors of London. Sir John Stuart Knill became the 3rd Baronet after the death of his father in 1934. However, he never actually registered the title, which meant that his Baronetcy was officially considered to be dormant, but that was a minor detail overlooked by the press. 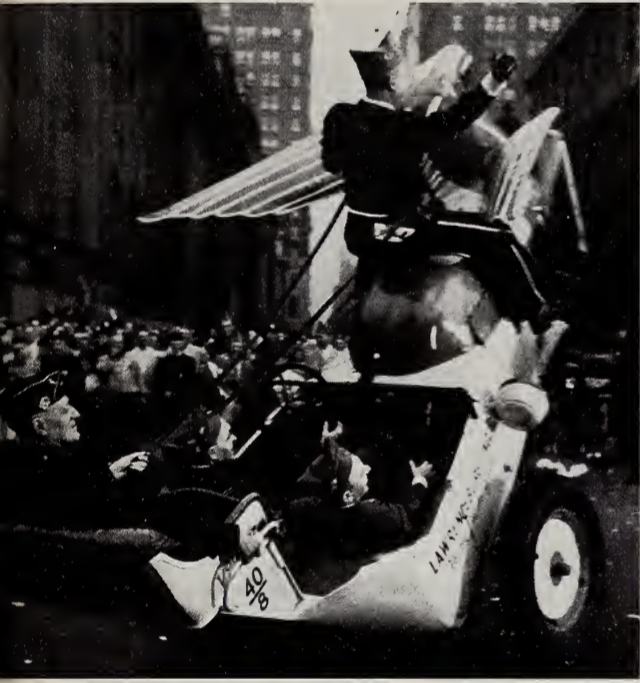 Knill's fortunes began to go south after World War I. He lost his family's ancestral estate, Knill Court in Herefordshire, and fell back on his knowledge of antiques to make a living, opening an antique shop in Brighton. 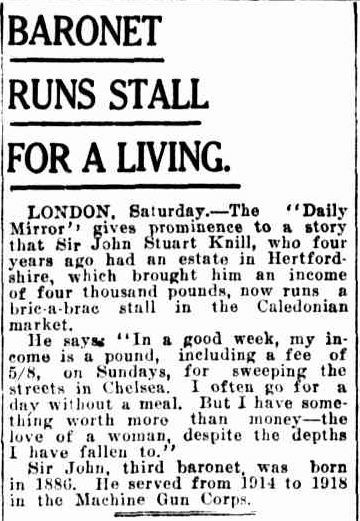 However, the shop failed to make a profit, so by the mid-1930s he had closed it and began operating a "bric-a-brac stall" in London's Caledonian market. On the weekends he swept streets. 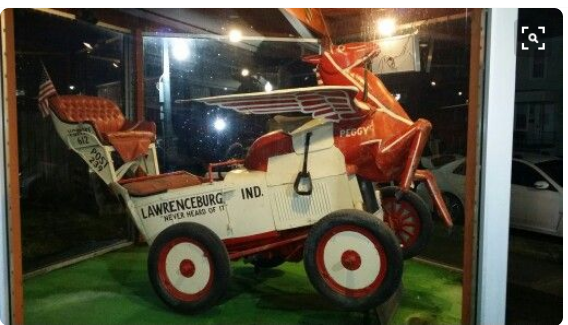 A job as a postman followed during the 1940s. His wife, Lady Ruth Evelyn Knill, supplemented the family income by working as a mill girl. Interviewed in 1950, she said, "We've lived hard and now we are down to rock bottom. I'm living up to my name. Of money, we have: Knill." The Knills earned extra cash by breeding animals in their rented apartment, but due to failure to pay the rent they were evicted in 1951 and moved into public housing. Each Sunday, Knill, 75, puts on his best tartan kilt, sets his wife in a chair facing a blank television set in their tiny living room and hypnotizes her. She stares at the blank screen and tries to "see" the winning combination. Both feel that their lack of success may be due to poor reception by Lady Knill. "It seems to depend on the weather for accuracy," she said. "On a dull day I have a job to 'read' the results. 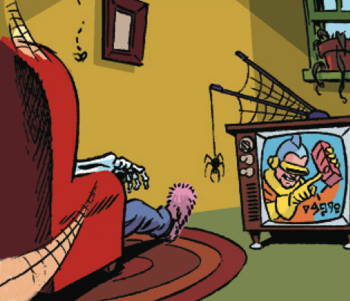 Normally, when he hypnotizes me the TV set appears to be switched on. Sometimes it seems so bright that I have to ask him to tone it down." 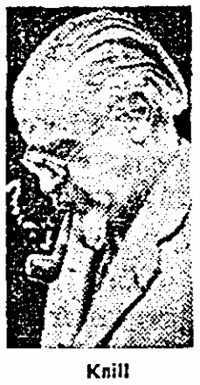 Knill died in 1973 at the age of 87. His son John (the 4th Baronet) was also quite a character. He was a long-time campaigner for the preservation of canals and was known around the city of Bath as a local eccentric, "propelling himself in a wheelchair operated by an astonishing system of levers, pulley and - it has to be said - cranks." More info about him here. Justin Bieber fangirl phenomenon, 1959 version. In his 1953 book Your Feet Are Killing You, Dr. Simon J. Wikler expounded his theory that just about every medical problem one could imagine (cancer, allergies, tooth decay, etc.) was caused by shoes. His solution was to go barefoot. Ideally all the time. 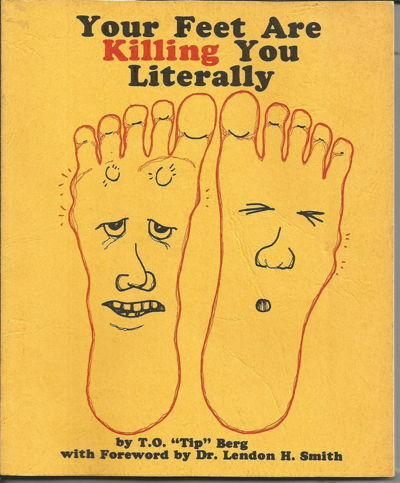 The title of this book is not used as an eye-catching facetious comment about a foot-sore individual. The author, described as a "Doctor of Surgical Chiropody," uses the words in their literal sense. He believes that foot imbalance is responsible for such "degenerative diseases" as cancer, rheumatic fever, chronic fatigue, diseases of the uterus, sexual disturbances, neuroses, essential hypertension, chronic alcoholism, narcotic addiction, allergies, eyestrain, and dental caries. He postulates that proper foot care will do much to eliminate these ailments. The chain of events leading to the development of these diseases is described as follows. 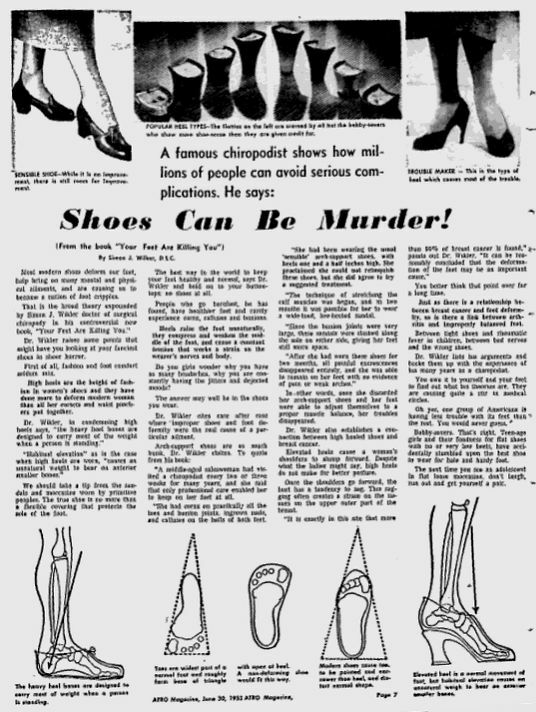 The modern shoe deforms the human foot, causes the muscles to shrivel, and leads to foot imbalance. Even the feet of infants are distorted because they are firmly tucked in under blankets or covered by tight stockings. Upon bearing weight, the deformity of the feet leads to a rolling out of the legs that carries the femora into external rotation. This deprives the pelvis of its anterior support, and allows it to dip downward in front. The spine is therefore forced into exaggerated curves, so that the abdominal space is reduced and the chest cavity is compressed. The vital organs and the blood vessels and nerves are displaced or abnormally stretched. The abnormal stresses lead to cancer of the breast, stomach, prostate, and uterus. To substantiate his thesis the author offers case histories and statistics. In addition to the development of this concept, the writer uses the latter part of the book to enumerate some foot ailments and to describe briefly the symptoms and treatment. 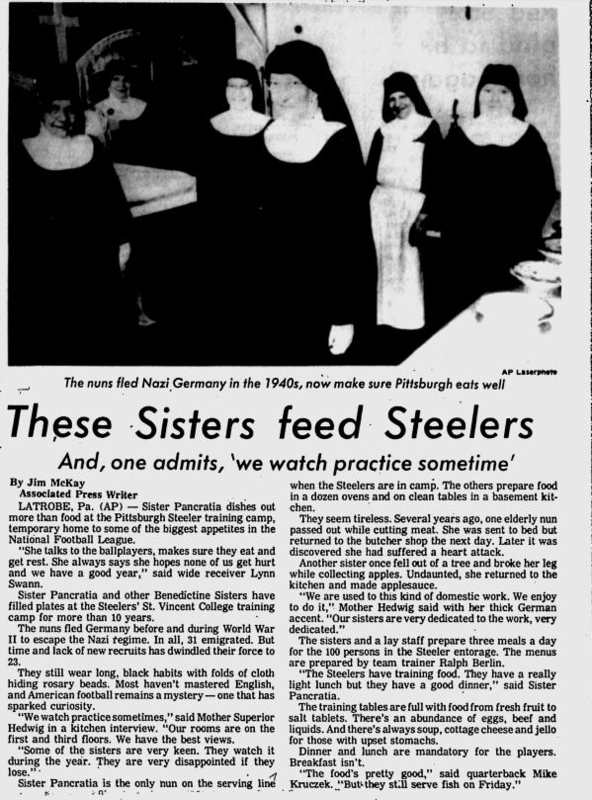 I guess the choice of training camp for the Steelers once necessitated commissary duty by nuns. Plus other help, as seen below. Not sure when this practice ended.